UPDATE AUGUST 2017: The Regional District advises that the trail and bridges to the Hardy Falls viewpoint are NOT anticipated to open this year (2017) due to extensive flood damage to the trail and several bridges. A recovery plan is being prepared for submission under the BC Disaster Assistance Program. Visiting the area and looking for something to do? Take a few minutes to stroll down to Hardy Falls. 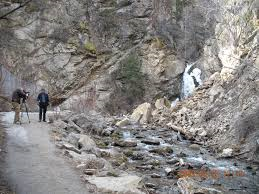 Hardy Falls is on Deep Creek at the south end of Peachland just past the Peachland Lakeshore Inn and beside Antler Beach Trailer Park. There is ample parking and public washrooms. The walk to the falls will take from 5 - 10 minutes, or if you enjoy it half as much as most people, it could take 30 minutes. 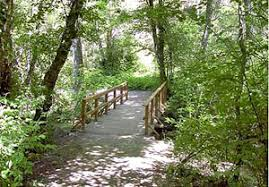 The short walk along an excellent walkway will cross Deep Creek several times as you make your way to the Falls. How many bridges are there? This walk is advisable for everyone, young and old, and is wheelchair accessible. The jaunt will take you through a steep-banked canyon to the falls. There are salmon berry bushes along the trail and in Sept/Oct the annual salmon run fills the creek with fish. There are benches to stop, take a break, enjoy the scenery and chat with others along the way. After a one month closure, the main trail in Hardy Falls Regional Park is once again open for visitors. The canyon trail to the falls viewpoint was closed due to bear activity on September 12th. People should respect all bears and anticipate and avoid encounters with them whenever possible. Bears can be aggressive, especially when defending their food or their cubs. Bears also have excellent senses of smell and hearing, and better sight than you might believe. For their safety, dog owners are reminded when in Regional Parks that their pets must be leashed and kept on trails at all times. Provincial Conservation Officers are advised of the bear sightings and along with Regional Parks staff, monitor the situation in local parks. As well, residents are reminded to keep any garbage securely stored on their property and please don�t put out your garbage cart until the morning of your regular curbside collection. That way you�re not tempting bears or other wildlife. Meanwhile, a portion of Scenic Canyon Regional Park and the Mission Creek Greenway (from Layer Cake Mountain Lookout to the Field and McCulloch Road parking areas) remains closed due to continued cougar activity in the vicinity. People should respect all bears and anticipate and avoid encounters with them whenever possible. Bears can be aggressive, especially when defending their food or their cubs. Bears also have excellent senses of smell and hearing, and better sight than you might believe. For their safety, dog owners are reminded when in Regional Parks that their pets must be leashed and kept on trails at all times. Please report any bear sightings in a Regional Park to Parks Services at 250-469-6232.